This post was sponsored by Marriott Hotels. All opinions of the hotel and my stay are my own. I never spend enough time in DC and it’s embarrassing how little I’ve seen of such a vibrant, culturally impactful city. Washington, DC is one of the most visited cities in the United States, for business and pleasure. And no wonder. With major iconic landmarks like The White House, Supreme Court, Lincoln Memorial and the home of industry chiefs like the Department of Energy, Capitol Hill and the National Archives, lots of work gets done. And just as much sightseeing. So I spent a weekend with Marriott at the Renaissance Arlington Capital View and Residence Inn Arlington Capital View, discovering some of what the capital had to offer. And it was quite a lot is a short amount of time! Situated South of the Pentagon, in the urban underground business district nicknamed the “Crystal City” in Northern Virginia, the Renaissance Arlington Capital View and Residence Inn Arlington Capital View are two sides of the same coin (or building) resting on the SW bank of the Potomac River. Directly across from Washington, D.C. The “view” in Capital View, describes the panoramic sights of the dome of the Capitol Building, the downtown skyline from across the water and up close and personal views of planes taking off from Ronald Reagan Washington National Airport. Almost exclusively populated by high-rise apartment buildings, corporate offices, hotels, and trendy shops and restaurants, the location for the Marriott brand hotels is an avid traveler’s logistical dream. Whether you're seeking to capture the luxurious spirit that Renaissance is known for or the quirky, independent earnestness that long-term business travelers rely on from Residence Inn, both are housed on prime real estate just less than a mile away from the airport. Inside both hotels, you’ll find fun, bright decor and affable staff. The Renaissance rooms are sleek and well-designed, with huge, plush queen or king sized beds, soft blue walls to promote relaxation, and a clean, bold minimalist decor.The bathroom, showers only, are hidden behind a big frosted sliding glass door and feature Aveda’s line of aromatic shower amenities. Hit the 7th-floor gym, or settle in for the night with on-demand shows and movies. A call downstairs for late-night nibbles includes fresh Gelato, delivered to your door. 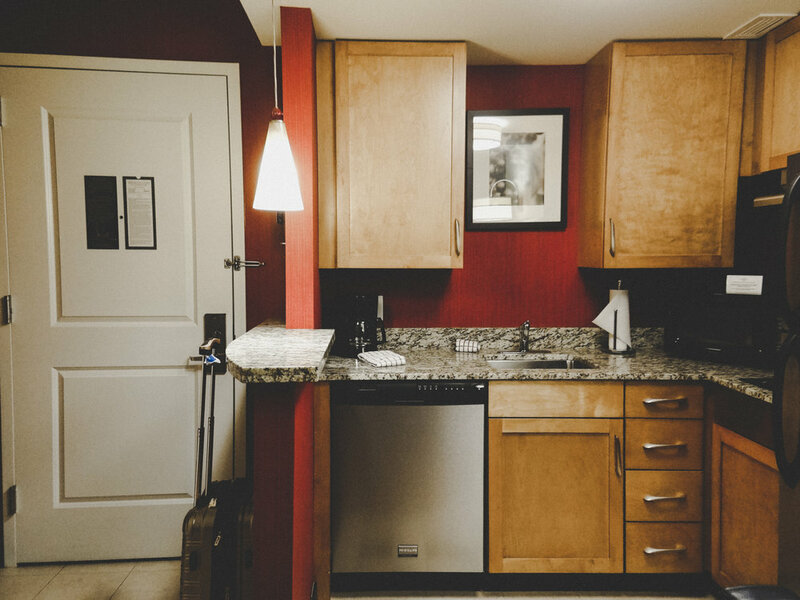 In contrast, the Residence Inn rooms have more a low-key, studio feel with darker red and orange hues to promote creativity and energy for travelers to spend more productive nights, working away from home. The room has an equally plush queen and king sized beds, bold red walls, and a sitting area with rotating television to separate sleep from leisure time. Studies show that longer-term TV watching bed disrupts sleep patterns. And work productivity. The room also comes with fully stocked kitchen items, double stove tops (no oven) and full-sized refrigerators for those trying to eat healthy on the road and tired of ordering takeout or eating in restaurants. Bathrooms feature traditional style tubs with shower for long soaks after a full day of meetings. Long-term travelers can wash and dry their laundry on site on the 7th floor before heading out to the terrace overlooking the Crystal City. There’s no boring hotel bars here, but rather the effortlessly hip space dubbed SOCCi, doing triple duty as a cool bar, Italian restaurant, and lounge. 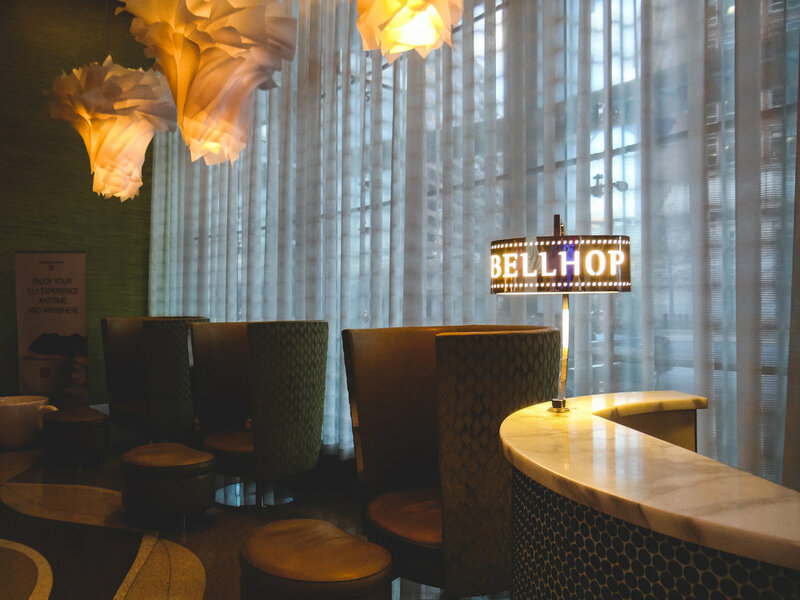 Residents of both hotels can mingle with a mix of locals and business guests while sipping cocktails like a London Lemonade or snacking on happy hour favorites like Spicy Sausage Hummus and House Chips + Balsamic Onion Dip (and a bit of pesto). 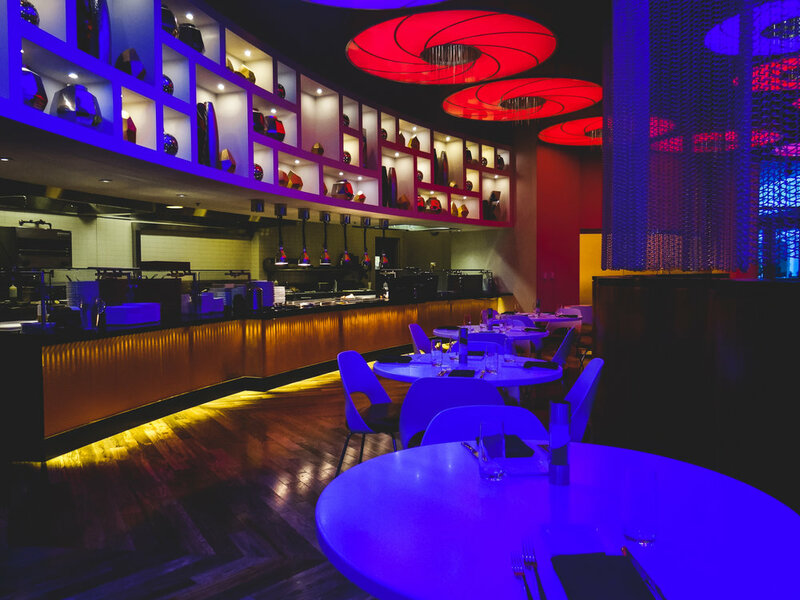 For breakfast, snacks, or dinner, SOCCi is the hotel’s mixed-use bar, eatery, and in-house food delivery service. The True North—northern salmon with avocado, mashed potatoes, edamame succotash and micro-greens — hit the spot for this tired traveler. The great appeal of Arlington, is its proximity to all things District of Columbia while managing to stay out of the high traffic areas in favor a calmer, more workable environment during the day. The second-largest principal city of the Washington metropolitan area, Arlington has gained acclaim of its own, as the home to important installations for the capital region and U.S. government, including the Pentagon, Reagan National Airport, and Arlington National Cemetery. Many schools and universities have campuses in Arlington, most prominently the Antonin Scalia Law School of George Mason University. The hotels’ excellent location also means the car stays put longer with no parking to deal with, and even then, it’s a just short ride across the Potomac to the bustling streets of Downtown DC. Whatever the reason for your stay, Marriott forms the basis for a perfect business + pleasure combination. After all, doesn’t everyone deserve a little fun after the workday? And all that fun... comes with perks! Special Offer: Winter Platinum Status. marriott.com. Rates starting at $170.